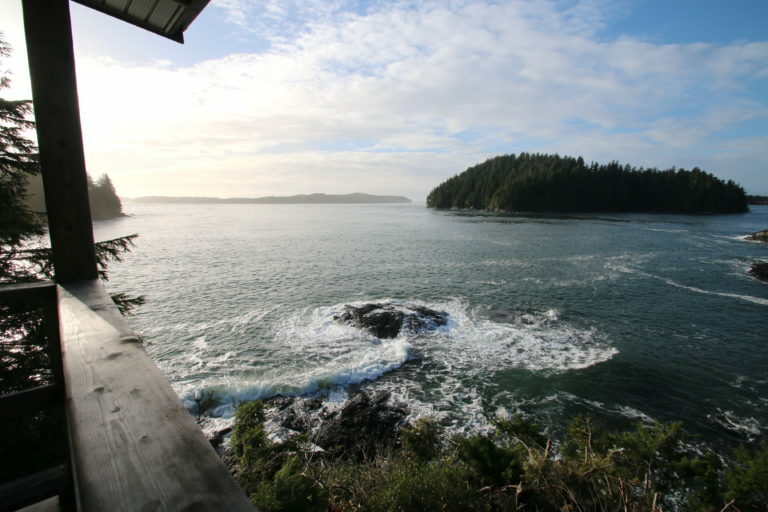 Hugging the west coastline of Vancouver Island and at the very tip of the peninsula, Duffin Cove is an oceanfront property, conviently located in town. Duffin is a boutique style property with several room types available. We have Ocean Front Cabins, One & Two bedroom suites, and Ocean Front King Studios. Our units will sleep from 2 persons to 8 persons and, we are pet friendly in some rooms by arrangement. Cabins: Privacy and views are at their best in our Ocean Front Cabins. 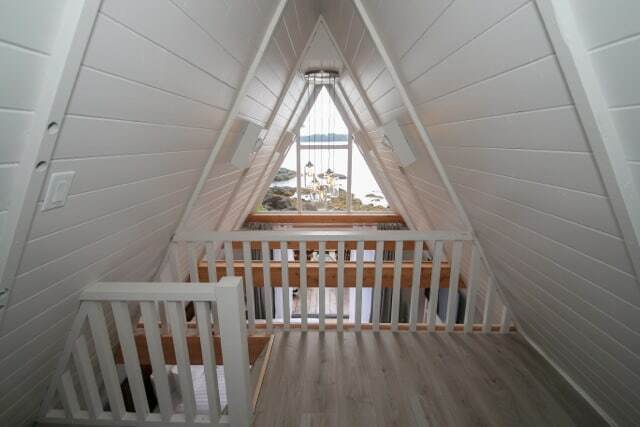 Accessed by 50 stairs into our private cove each cabin is placed on the shore’s edge. 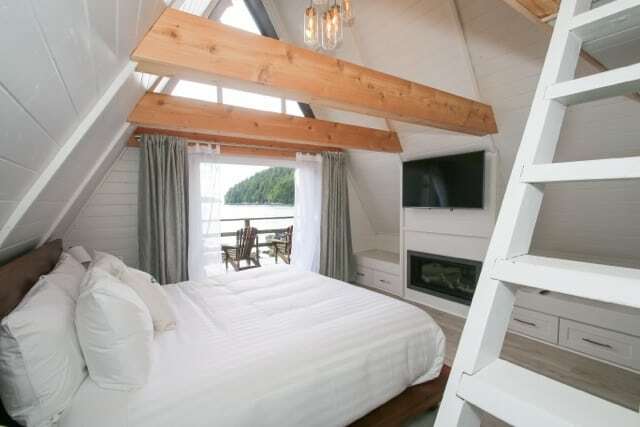 You can fall asleep here to the sounds of the ocean, or the cracking of your wood burning fire. 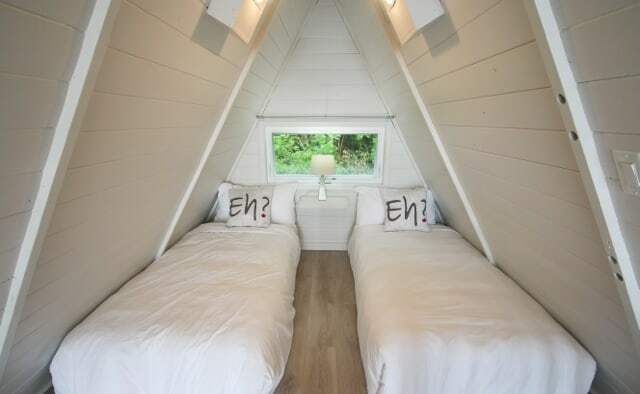 The cabins feature a full kitchen, wood burning fireplace, bbq, living area, and sleeping for up to six persons. King Studios: The Ocean Front studios feature a king bed, sitting area, coffee, and tea service, mini fridge, and an Oceanfront balcony. 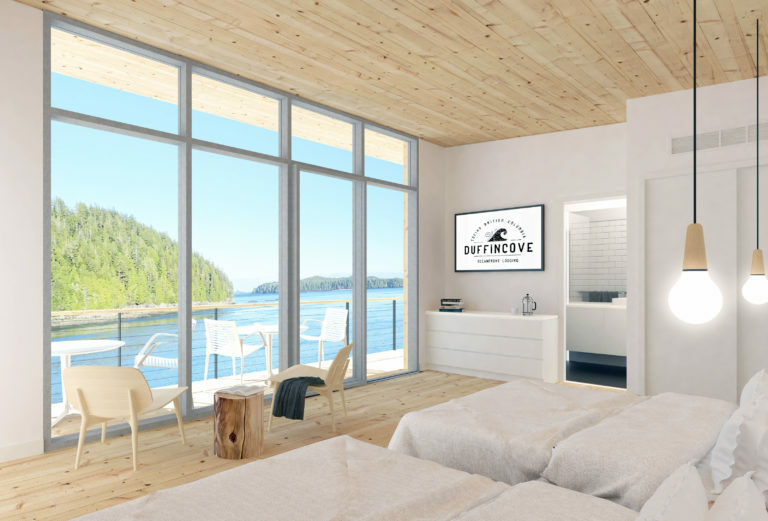 If you’ve come to Tofino and want a great location with a great view, the Ocean Front Studios at Duffin Cove will leave you breathless. A well equipped and comfortable room, with ‘million dollar views’ from every balcony. Premium King Studios: Perched upon a cliff overlooking the ocean and features one king bed. 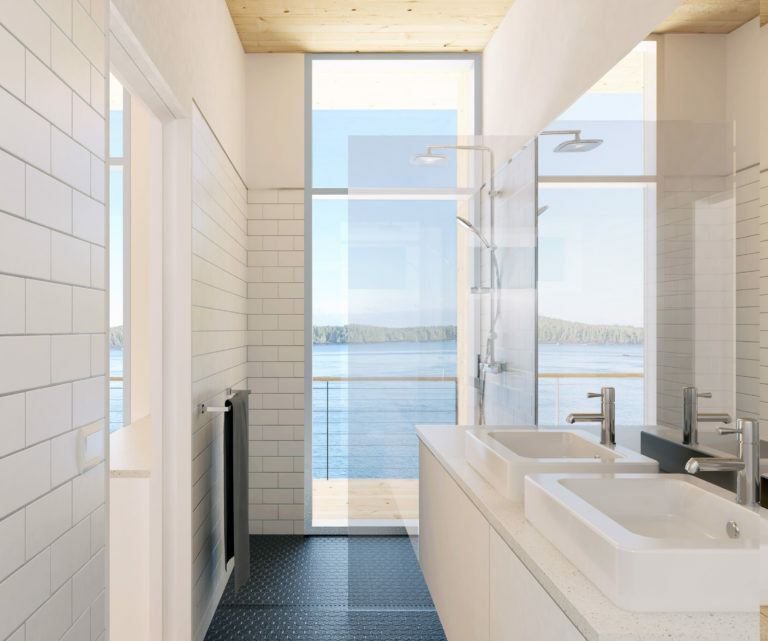 All units have luxury bathrooms with double sinks, rain head showers, and amazing views. Some adjoining rooms are available to accommodate larger groups. Dogs permitted in some units. 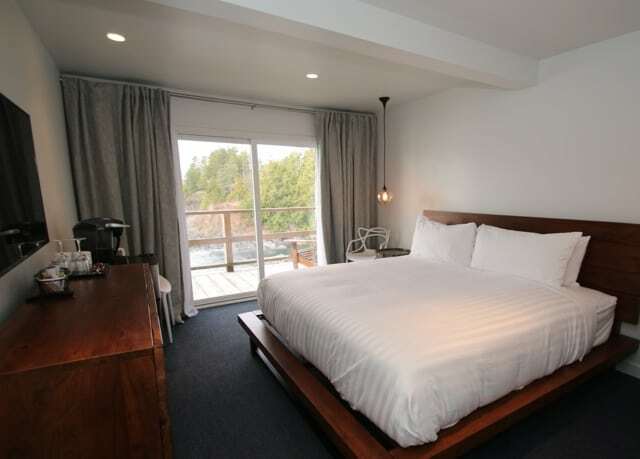 One Bedroom Suites: Our one bedroom suites are a perfect home base for families or couples exploring Tofino. The suites are located in our garden building and boast ocean and forest views. These rooms feature a queen Spring Air bed, kitchenette, living area, 50 inch Smart TV, BBQ access, and sleeping for up to 4 persons. Two Bedroom Suite:.Larger groups will enjoy the space the two bedroom suite offers. The living room and kitchen have ocean views. The two bedroom suite features two queen Spring Air Mattresses, a full kitchen, living area, a 50 inch Smart TV, access to BBQ, and sleeping for up to 7 persons. Premium Double Studios: Perched upon a cliff overlooking the ocean and feature two double beds. 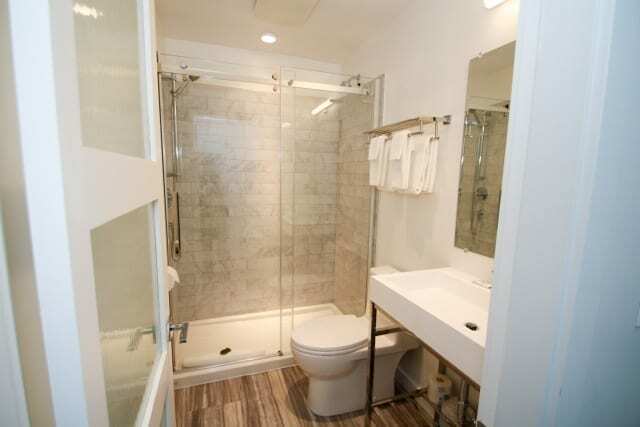 All units have luxury bathrooms with double sinks, rain head showers, and amazing views. Some adjoining rooms are available to accommodate larger groups. Garden Studio: Our smallest room will not disappoint. A cozy space for a couple or single person to relax after a day on the beaches. The Garden studio features a Queen Spring Air Mattress, a 50 inch Smart TV, kitchenette, access to a BBQ, and an eating area.